Shandong Tiancheng Chemical Co., Ltd.
Shandong Tiancheng Chemical Co., Ltd was established in 1999, located in Yanzhou district ,Jining city, Shandong , China ,a high –tech enterprise on business of research, development, produce, trade ,etc. The main products cover paper chemicals, Water Treatment Chemical etc. We produce and export Cationic Reagent , Alkyl Ketene Dimer, AKD Neutral sizing agent , Surface sizing agent , Wet Strength Agent , Dry Strength Agent , Retention aid , Lubricant , AKD Emulsifier ,Polymer emulsifier , Softening agent , Zirconium Oxychloride, Curing Agent , Polyacrylamide , Calcium Chloride, Aluminum Chlorohydrate. The products are not only sold through the country , but also exported to North America , Europe, Japan, Korea, Southeast Asia and other countries or regions . The quantity , quality and technology of paper chemicals leads top in the world. AKD powder is also called AKD wax. Chemical name is Alkyl ketene dimer. CAS registration number is 144245-85-2. Appearance is pale yellow flake or granular solid. It is produced by fatty acid (C≥16), via acylation and dehydrochlorination to become AKD wax. 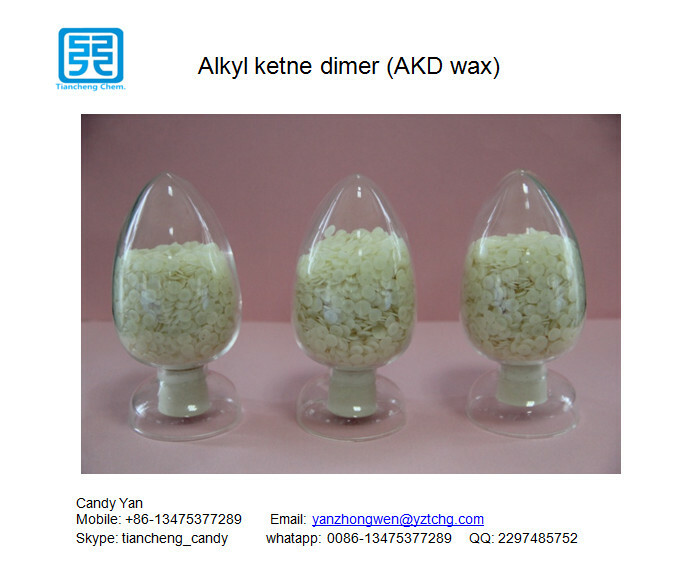 AKD wax is mainly used for papermaking neutral sizing agent. R or R' in the above structural formula is the alkyl group, and a series of alkyl ketene dimers can be obtained through modifying different alkyl groups. Octodecane and cetane are applicable to the papermaking neutral sizing agent. and makes esterification reaction with the hydroxyl in cellulose. AKD wax can be made into AKD emulsion applied as in sizing agent in the papermaking production. AKD wax is emulsified by the cationic emulsifier, and melted AKD wax and emulsifier undergo high-speed shearing and high pressure homogenization to form the liquid AKD sizing agent after cooled. positive charge by virtue of cationic starch and PAM and other retention agents; In the pressing and drying process of the paper machine, these globular AKD particles are easily expanded and distributed on the surface of fibers due to the lower melting point to form a homogeneous cover film; When paper is dried and stored for a period, the active group (lactone ring) on AKD molecule makes the esterification reaction with the hydroxyl on fibers under certain conditions to be binding on fibers in the form of fixed covalent bonds. Hydrophobic long-chain alkyls transfer to the paper surface in order to give the penetration resistance to paper. Established in 1999, Tiancheng Chemical Co., Ltd. has a history of about twenty years till now. Shandong Province (Tai'an and Dezhou). In 2008, the output and quality of Tiancheng's AKD wax ranked the top in the world. In 2009, ventured with Finland Kemira Corporation, Kemira Tiancheng Chemical (Yanzhou) Co., Ltd. was established. intelligence, economy and environmental protection. As a kind of initial powder of neutral sizing agent, is used in making neutral sizing agent latex of paper pulp. Looking for ideal Alkyl Ketene Dimer Manufacturer & supplier ? We have a wide selection at great prices to help you get creative. All the AKD Wax are quality guaranteed. 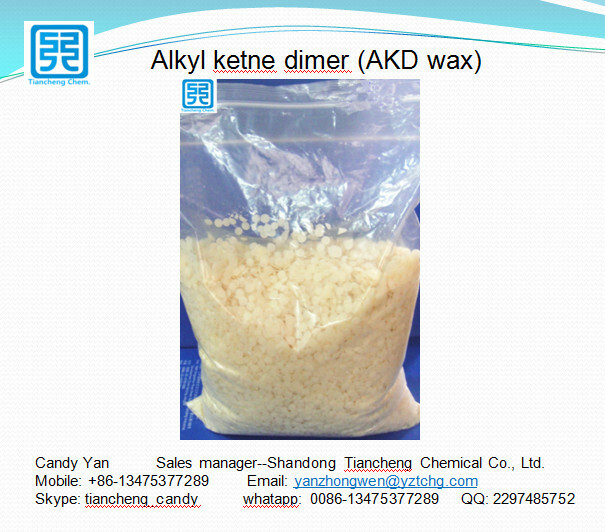 We are China Origin Factory of Alkyl Ketene Dimer Wax. If you have any question, please feel free to contact us. Copyright © 2019 Shandong Tiancheng Chemical Co., Ltd. All rights reserved.